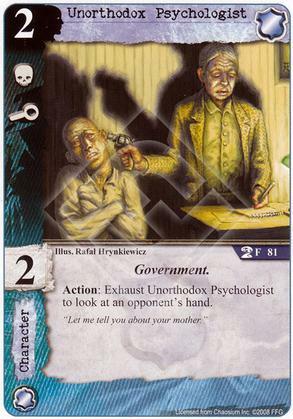 Flavor Text: "Let me tell you about your mother." You know, I've always felt like this card was such a tease. Ordinarily, you're having to choose one: try for 3 success tokens at a story, or see what your opponent has in his hand? To me, it was like you were getting either a nice body with no ability, or you were getting a support card with a nice ability. It annoyed me that I couldn't easily get the ability and the attacking too. I had a similar beef with Trial Judge, Agency Bodyguard, Mr. Grey, etc. So, here's to Franklin Automobile and San Marco Basilica! Love you guys! Abilities AND attacking in the same turn makes me happy! Dr. Christine Marie took over her role. Well, sorta. The icons are different, and the possibly-important Government subtype is missing from Dr. Marie. It's true that the newer card is far more efficient for viewing the opponent's hand, though. Unlikely Informant still works pretty well, too.